A few weeks ago, we had the BOO-TrainingPeaks professional cyclocross team over for TrainingPeaks Live, and we got to pick their brains about ‘cross, bamboo bikes, how to grab two beers in one handup, and more. You can watch the full video here, but one of the highlights from the interview came when we asked the guys about how they structure a typical training week once they’re in the middle of a busy ‘cross season. We followed up with them afterwards to get some more details, and with their help we put together the following snapshot of their typical mid-season training week. Here’s how two seasoned pros maintain their competitive edge but ensure that they get the rest and recovery they need. I’m usually tired from the weekend of racing, so Mondays are always my day off. On Wednesday, I do something similar as Tuesday because it’s all about those two events right in a row that you have to perform at. Wednesdays vary, but as early season as Sep 25 this year I did a big base day of just holding a good, consistent Z2 tempo for four hours. Recovery, or skills on a day that I feel good. My skills days consist of mostly practicing barriers and a limited amount of short sprinting workouts. Travel and/or openers — just letting your legs breathe for the race. Openers really are just any time getting out and pedaling. I do a little time warming up, a little at base pace, and some harder tempos, but I don’t do anything to hard, to save the muscles for the next day. 2-3 hour easy recovery ride on the road or MTB. If I haven’t done a race on Sunday, then usually I’ll incorporate some explosive intensity, such as like 6 x 30 sec all-out sprints with 5-minute recoveries. Or I might do the Tuesday Night Worlds ride (up to an hour of race simulation) that night if I haven’t done any intensity during the last weekend. I follow up with stretching and recovery with a foam roller. 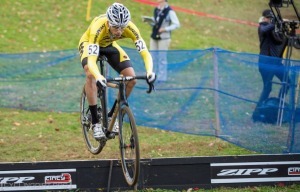 Cyclocross race simulation. 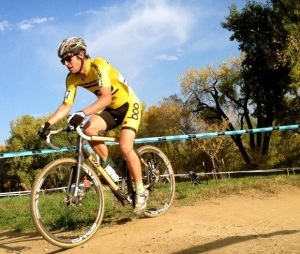 In Durango, we have a group that does Wednesday CX practice together on campus [at Fort Lewis College]. We set up a different course every week and simulate a race on it, nothing official, but with some really fast local riders participating. Our usual practice is a 30-40 minute gradual warm-up that includes riding the CX course at approaching tempo pace. Then, a race simulation of 20-30 minutes (4-6 laps, depending on the lap length). Another easy, shorter day of 1-2 hours on the road, or on the CX bike with some skills. There’s no structure to the practice, I just ride around the technical elements in Durango and practice cornering, hopping barriers, dismounting, run-ups etc. Openers and race travel. In my openers I incorporate some intensity depending how recovered I feel. In total there are usually between 5-10 minutes at 95% of race effort — I’m not targeting any specific heart rate or power, but typically the effort will reach threshold and hopefully even higher, meaning I’m fresh and rested. Race! If I don’t race, then I make sure I get one day with some race simulation (up to 45 minutes, like I do on Wednesdays). The second day will be a long endurance ride at 70-80% of my max heart rate. A surprising amount of flexibility in the schedule. While both guys train with heart rate and power, they’re also both tuned in to how their bodies feel from years of racing, and neither let the numbers or prescription be the “end-all” in deciding how they train. Whether you lean more towards Rotem or Skyler’s approach, or one that’s completely different, incorporating the key elements above will help you to stay in competitive form throughout the rest of the cyclocross season.